In the United States, approximately nine out of every 10 adults suffers from some kind of tooth decay. Fortunately for Americans suffering from tooth decay, a tooth crown is considered to be one of the most common forms of restoration. A tooth crown is when a dentist removes the decay so that the tooth itself is significantly smaller than before but healthy. An aluminum or silver cap is then placed over the remaining tooth to allow for proper function. This is done in order to preserve the life of the pre-existing tooth. Before you receive a crown, it may be a good idea to ask your dentist why the crown is needed. Typically, a crown may be needed if it hurts when you bite down. The pain you experience when biting down may be caused by a crack in your tooth, which cannot heal like a regular bone fracture. The most common kinds of tooth cracks are known as vertical cracks. Vertical cracks in a tooth often require a full-coverage crown. Should the crack continue to the gum line, a root canal may be required. However, should you have a craze line rather than a crack, you may only need teeth whitening from a cosmetic dentist to recover your smile. 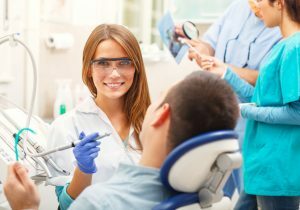 If your dentist recommends that you receive a crown, it’s most likely that you will not require a root canal. Root canals may only be needed when a vertical crack in a tooth has reached the gumline of your mouth and the root itself needs to be killed and extracted to prevent pain. What will happen if I wait on receiving a crown? Most likely nothing will happen if you wait to receive a crown. At most, the tooth’s damage may increase and you may require a root canal or tooth extraction. Tooth crowns are a common tooth restoration tool. Tooth crowns help to prevent the need for tooth extraction as well as any further decay. If you experience pain when you bite down, consult your dentist today.